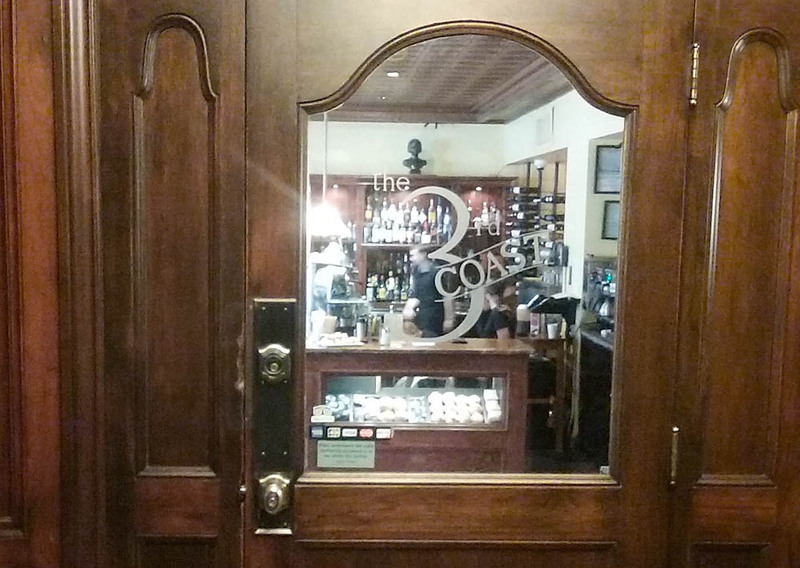 We set out Monday on an architectural safari on some of Gold Coast’s oldest streets. I planned to write about the architecture there, but instead we got very hungry, so this post will be about our lunch. Astronomers and Google say that March 20 — almost two weeks ago — was the first day of spring, but that usually implies an appearance at some point by the sun, which we haven’t seen for weeks. Regardless, however, the temperatures have continued to rise, and our plan was to walk to Dearborn Street to look at the historic Mantonya Flats. The Moorish arched keyhole windows are a unique contrast to the neighboring brownstones. Unit No. 2 was listed for sale earlier this spring for a price of $699,000. Dating back to 1887, the building was designed by architect Curd H. Gottig and constructed by builder Lucius B. Mantonya—likely as a single family home. Though the structure spent some time under a coat of gray paint in the middle part of the 20th Century, the largely-intact exterior has been restored to its original coloration despite the address being divided into three individual dwellings. On our way to Dearborn, we were impressed by the number of homes that already had staked their claim to the upcoming summer. Pansies were plentiful in window boxes and the greenery was well along in the bushes. These homeowners or their gardeners must be pretty confident that the evenings won’t dip one last time into the freezing zone. By now it was pushing 1 p.m., and we were hungry. Nearby we found the 3rd Coast Café and Wine Bar. Set slightly below street level at the corner of Dearborn and Goethe, the restaurant has a nice neighborhood feel. Despite being busy at the end of the lunch rush, we were seated quickly. The crowd was a nice mix of young and old. There were a few tables of what appeared to be adult children meeting their parents for lunch. In the corner, two Chicago police officers finished their meal. There were plenty of options on the menu, including breakfast, brunch and dinner specials. The also offer burgers, tacos and fajitas. I chose the coronation chicken salad, made with chicken, rice, curry, mango chutney, raisin, peas, apple and mayo on a lightly grilled baguette. The bread was wonderful — soft with a not-to-crisp crust. The chicken salad had a fresh mix of flavors, and the curry provided a hint of extra flavor, yet was not overpowering. The soup of the day was a cilantro bean combination. The unique mix of cilantro perked up the bean. 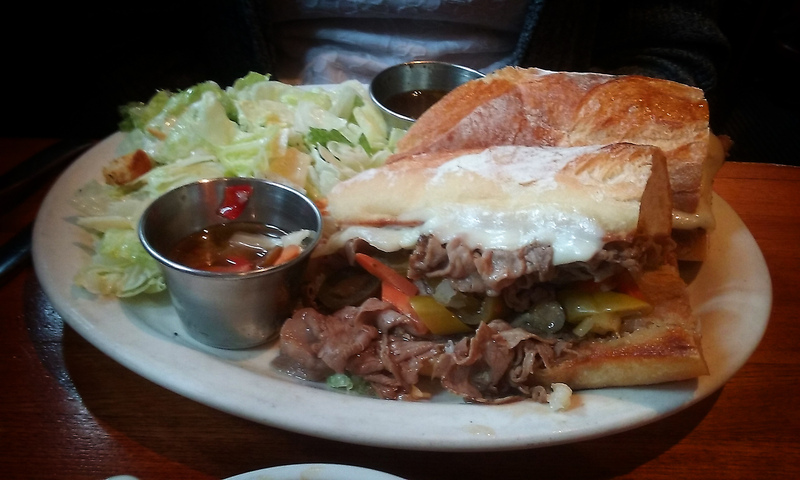 Laura, who always is on the lookout for any variation of the hot Italian beef sub, chose the Diablo beef, which is shaved Italian beef and melted mozzarella, Chicago style giardiniera and au jus on a grilled baguette. 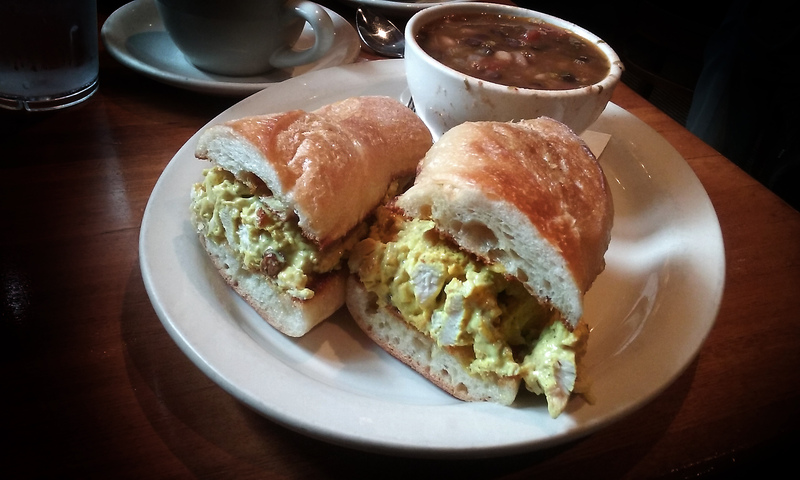 The sandwich arrived hot, and with the added giardiniera, had a nice “kick.” Perfect if you’re inclined to spicier food. After lingering with our meal and coffee, the café slowly began to clear out, although many like us appeared in no rush to finish lunch. 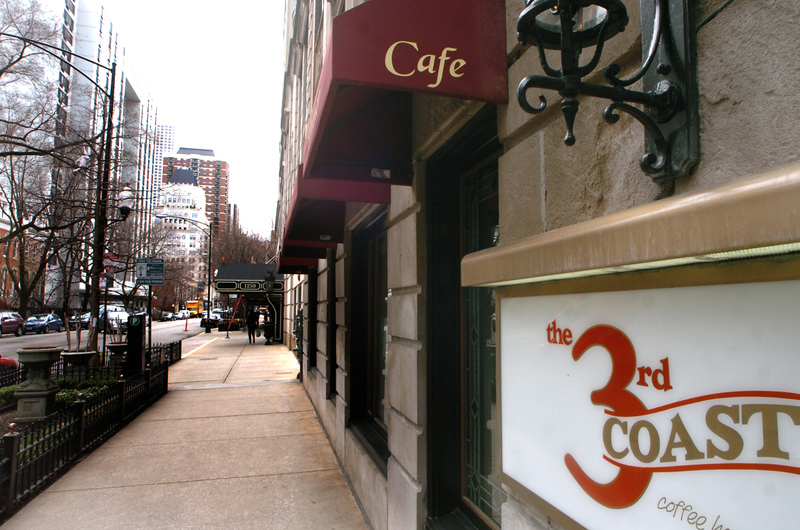 If you’re looking for a place that feels like home, 3rd Coast is worth a visit. Coronation chicken salad, 3rd Coast Cafe, Chicago. Dan Plutchak photo.